Alexandra Witze’s story, which introduced readers to the seismologists who work 24 hours a day to pinpoint major earthquakes around the globe, won a AAAS Kavli Science Journalism Award in 2015. Witze is a contributing correspondent for Nature and Science news. Seismologists at the National Earthquake Information Centre are on duty 24/7 to monitor quake activity. Photo courtesy of Barry Gutierrez (originally published in Nature). Sanders was part way through his shift as an on-duty seismologist at the US Geological Survey’s National Earthquake Information Center (NEIC) in Golden, Colorado. It was his job to work out what was happening—and fast. Within 30 seconds, he began analysing the seismic data and realized it was time to call his boss. The AAAS Kavli awards are designed to recognize distinguished science reporting by professional journalists. This story (and two others) won a Gold Award in the Magazine category in 2015. The NEIC takes up the fifth floor of a blocky building on the campus of the Colorado School of Mines in Golden, not far from the original Coors brewery and bronze sculptures of the miners who shaped this region of Colorado. A decade ago, television satellite trucks regularly clogged the car park after any large earthquake. Now, most of the journalists stay at home—they can get information from the centre faster over the Internet. A second seismologist on duty that night called and woke Earle, who began to work on the seismic data from home. As the minutes ticked away, the three of them faced a crucial task—deciding on the quake’s magnitude. The USGS measures eight types of magnitude, each of which conveys different information about the strength of an earthquake’s vibrations and the amount of energy it releases. Certain magnitude scales are most accurate for smaller quakes, whereas others are better at describing long-lasting, larger shocks. At 12:29:42 a.m.—18 minutes and 16 seconds after the earthquake began—the NEIC released its first answer. Location: 77 kilometres northwest of Kathmandu. Size: 7.5 on the moment magnitude scale. This particular scale relies on computer modelling of a certain type of seismic wave, and Earle chose it because of a gut feeling for what he thought would represent the most meaningful magnitude. 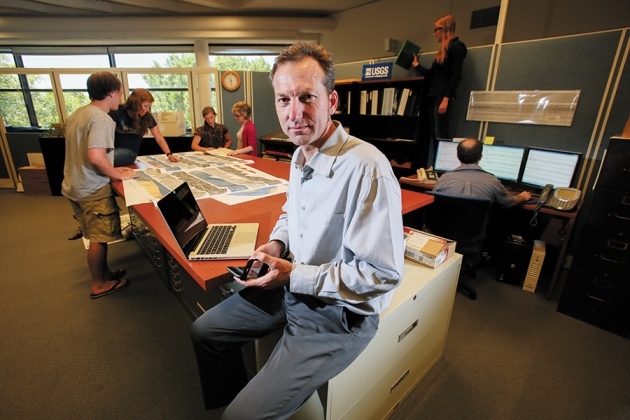 Paul Earle and the team at the earthquake centre issue alerts for major quakes within 20 minutes. Photo courtesy of Barry Gutierrez (originally published in Nature). The most recent estimates suggest that the 25 April earthquake and its aftershocks, including a magnitude 7.3 on 12 May, killed roughly 8,700 people—close to the PAGER estimates of around 10,000 deaths. Other catastrophe experts had estimated 50,000 dead or more, using independent assessments of population exposure and building vulnerability. And in May this year, the USGS reported several phantom quakes in California—in reality, they were vibrations from more-distant shocks in Alaska and Japan. An on-duty seismologist had caught the problem, but the software that distributes the alerts had not responded to the correction. The NEIC keeps pushing to shave as many seconds off its own notifications as possible. One ongoing project involves Twitter. Earle has set up an automated system that hunts for words such as ‘earthquake’ in various languages in tweets from around the world (P. Earle, Nature Geosci. 3, 221–222; 2010). He has to filter out unrelated instances, including references to the video game Quake, but once that is done he can get a heads-up that something big is beginning. When someone in Indonesia tweets ‘gempa‘, or earthquake, “it’s on our server in five seconds,” he says.